For a country that has its shares of struggles with sexism, the fact that the most recognizable fictional superhero in modern Filipino history is a woman serves as a shining beacon of hope: Darna. With Liza Soberano starring in the latest Darna film, directed by Erik Matti, let's take a look at the Kapamilya actress' journey to becoming the superheroine of the Philippines. Created by Mars Ravelo, Darna's (then known as "Varga") first appearance was in Bulaklak Magazine in 1947 and her first film appearance was a few years later in 1951. The story follows Narda, a village girl who finds a mysterious white stone that fell from the sky. She hid the stone in her mouth and accidentally swallowed it. She then began to see visions of an alien planet. When her grandmother asked what was engraved on the stone, with a mighty shout she says, "Darna" and transformed into the superheroine. Her adventures consist of preventing crimes, citywide disasters, and fighting off supervillains. She's accompanied by her younger brother Ding—receiver of the iconic line, "Ding, ang bato!" In May 2017, ABS-CBN officially announced the casting of Liza Soberano as the new Darna for the reboot. The actress rose to stardom as half of the LizQuen love team starring in Forevermore (2014) alongside Enrique Gil. Now she's ready to take on her biggest role yet, a character that's been in public consciousness for decades. Her previous role in the recently concluded fantasy series Bagani could have prepped her for this epic adaptation. The reaction to the news has been divisive, with fans already reimagining her role as Darna through artwork way before the announcement was made. But there are also naysayers who doubt if she's "Pinoy enough" to be Darna. However, Liza doesn't let the negativity affect her and knows that there are many more who support this decision. Many stars have taken on the role and it can be an immense pressure to live up to expectations. Fortunately, former Darna actresses have got Liza's back and send their support. Marian Rivera, who played Darna in the 2009 series, believes that Liza can pull it off. One of the most famous portrayals of Darna is Vilma Santos' version from the '70s. Vilma imparts advice to the newest Darna to completely own the role and wishes her all the best. Angel Locsin, who played Darna in the 2005 TV series, was going to reprise her role but backed out due to health concerns, gave a bittersweet, heartfelt message to Liza in an Instagram post. Angel sent Liza her copies of the Darna comic books that were given to the former when she was preparing for the TV series. Angel has kept the comics for a decade and decided to gift it to Liza so that she can get ready to don the Darna costume. The amazing amount of support from former Darna actresses towards Liza Soberano's casting proves that there's no need for petty rivalries and competition among the fandom. True to the values of the superheroine in question, these women were gracious enough to welcome this generation's Darna. Marami-rami na ring kamay ang dinaanan ng mahiwagang bato. At sa tagal ng paghahanap, ikaw ang mapalad na napili para magpatuloy ng galing at tapang ni Darna. Maraming salamat sa pagtanggap! Nagmamahal, Ang Pamilyang Ravelo." Nothing legitimizes Liza's claim to the Darna role more than the creator's descendants publicly giving their blessing onstage. 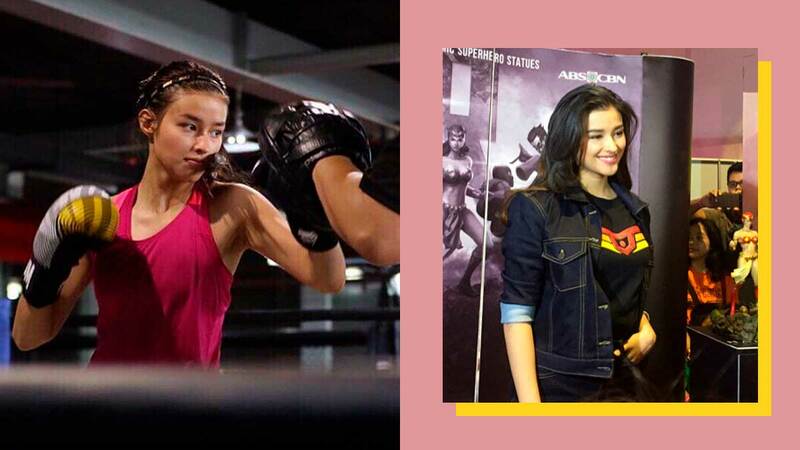 Liza began her superhero workout under celebrity trainer Bok Santos as early as last year to prepare for her role. We're sure she's prepping to do a ton of physically demanding action sequences for the movie. As soon as fans heard about the new Darna film, those with artistic inclinations went to work on their own versions of the two-piece costume. Will it undergo the same modernization as the Wonder Woman film? An earlier report has shown designer Rocky Gathercole's version of the Darna costume. According to a PEP.ph interview with Erik Matti, they've already gone through 15 designs before deciding on the final one and that will have both form and function. We may have caught a glimpse of the design upon viewing the Darna teaser released earlier in the year. Although, anything many aspects could change between production and the final release. All systems are a go with director Erik Matti at the helm of the upcoming Darna film adaptation. Known for his gritty action films such as On The Job, Honor Thy Father, and the recent hit BuyBust, he will be breathing new life into the franchise. With direk cheekily naming the project under the hashtag: #theprojectthatshouldnotbenamedyet we've gotten a peek into the progress of the Darna film. Mothership VFX, the company that worked on the special effect of Matti's Kubot: The Aswang Chronicles films, has been tied to the production early on as shown by both director Erik Matti and producer Dondon Monteverde's respective posts. A sample reel by Mothership showcasing Darna saving citizens from a volcanic eruption went viral earlier this year thus, cementing their involvement in the film. There was another person who used the hashtag, Ays De Guzman, a writer who previously worked on the 2017 rom-com film, Luck At First Sight starring Jericho Rosales and Bela Padilla. Erik Matti's dedication to the project is a testament to his admirable work ethic as he refutes tabloid rumors that he's back out from the project. In a message on social media, he states, "And for Darna, no matter the years we put in, our commitment to see it through stays. I am a finisher." A superhero is nothing without their evil counterpart. The best kind of supervillain is the one who can go head-to-head with the protagonist on equal ground. This type of antagonist wields powers beyond human capabilities and knows their hero enough to engage in vitriolic banter. Valentina remains just as popular as Darna in Pinoy pop culture history. Her Medusa-like full head of serpent locks and ability to communicate snakes and perform mind-control made her a force to be reckoned with. It definitely takes a certain kind of kontrabida attitude to take on the fabulously diabolical role with actresses such as Cristina Aragon, Pilar Pilapil, Pilita Corales, and Cherie Gil. Of course, Celia Rodriguez is most known for portraying the supervillainess during Vilma Santos' run as Darna in the '70s. Just like the previous Darna actresses, this former Valentina also supports the continuation of the franchise. Anne Curtis has been a popular contender for the role and has already expressed interest should she be offered to play Valentina. We've already seen Anne's skills as an action girl in the recent Erik Matti-directed film BuyBust where she pulled off a one-shot fight sequence. And even Liza herself would be game to star opposite Anne. Other actresses thrown into the mix were Iza Calzado and Sarah Lahbati. During a recent interview, Erik Matti already confirmed that they have found their serpent queen but didn't reveal who was chosen. After confirming that the Darna team has locked down a Valentina, Erik Matti also shares that they have completed the cast but it's being kept tightly under wraps. However, it was previously reported that La Luna Sangre actor Tony Labrusca is rumored to be playing Darna's love interest. When Will Darna Take Flight? It's been more than a year since Liza Soberano was cast in the coveted role of the iconic superheroine and everyone's still working hard on the reboot. They started filming scenes early this year and there have been fan sightings but no official stills on-set as of writing. The only fan sighting that could be connected to the filming was seen back in March where Liza was wearing casual clothes where we could assume she was shooting her Narda scenes. There's no confirmed release date as of now but it's said to be released late 2019. Hopefully, we'll find out more in the coming months.